We at "FIREFREEZE" are involved in installation and maintenance of all type of fire alarm systems and fire protection systems. We have full expertise on engineering ,design, supply, installation and testing commissioning of fire protection systems on turnkey basis. We represent all major manufacturer and suppliers of industries having UL listed and FM approved products. We are approved and registered vendor and contractor for Saudi Aramco, Sabic Groups, Saudi Electric Company (SEC), Saudi Telecom company (STC), Ministry of Health (MOH), Ministry of Interior ( MOI), Saline Water Conversion Corporation (SWCC) , EPCC and local civil defence authorities. Our professional Engineers are in this field since last twelve years. 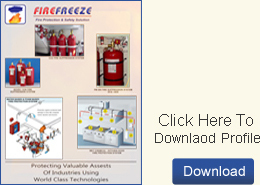 We have designed and executed various type of fire protection system right from base design to commissioning. The numerous projects executed by our team in Government, Semi-Government, Power Plants, Sub Stations, Commercial and Residential Buildings throughout Kingdom Of Saudi Arabia. We can provide our full details profile which contains total list of projects executed by our team.